The Opaline Gourami is a long time favorite with aquarists, and a very attractive fish that comes in a variety of color patterns! The Opaline Gourami is a very attractive color-morph of the Three Spot Gourami Trichopodus trichopterus (previously Trichogaster trichopterus). This is a long time favorite. Its colored in a light bluish tone that's topped with a darker marble-like patterning, and thus it is also known as the Marbled Gourami. The pattern is dynamic and variable, making this pretty fish an appealing addition to a community aquarium. This gourami is one of many varieties of the Three-spot Gourami. Breeders selectively pair individuals for their desired coloration and strengthened it over several generations. Other well known varieties included a gold color form called the Gold Gourami and a silver form called the Platinum Gourami, both of which appeared in 1970. The majority of these gourami mutations are commercially bred in the Far East and Eastern Europe. 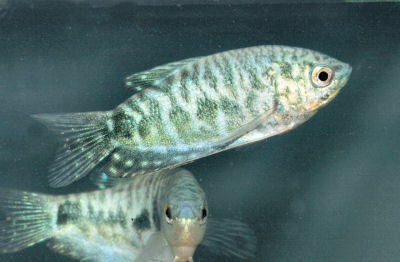 The predecessor of the Opaline Gourami is the Cosby Gourami, developed by the American breeder named Cosby. The Cosby Gourami is an early color form of the Blue Gourami developed for a silver blue base topped with darker blue markings. From this came the Opaline Gourami which is now commercially bred itself in many different color variations. Because inbreeding is common in its genetic history, it is in the aquarist’s best interest to take extra care when choosing specimens. Look for a well formed fish free of skeletal defects or other deformities, and without obvious injury. Sulking or resting on the bottom of its environment is never a good sign. Gouramis are members of the suborder Anabantoidei, also called Anabantoids or Labyrinth Fish. They are distinguished from other fishes because they posses a "labyrinth organ". This is a respiratory organ that allows them to get air at the surface of the water. Like other fish they still have the ability to pass water through their gills to obtain oxygen, but they are also able to breathe atmospheric oxygen. Labyrinth fish are also characterized by their habit of building bubble nests. This male will build a floating nest full of bubbles at the surface of the water and once the female lays the eggs, he will place them in his nest and guard them until they hatch. The Opaline Gouramis are very similar to their predecessors in all aspects other than coloring. They are the same in size and have the same habitat and care requirements. 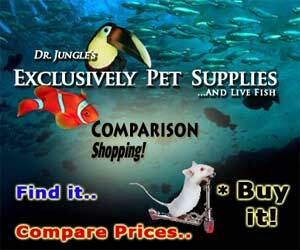 These are some some of the hardiest aquarium fish and make an excellent choice for the beginning aquarist. They are long lived and easy to breed. They use their pelvic fins to explore their environment and even feel their tank mates. Each individual has its own remarkable personality and they also seem to be quite aware of their owners. Generally they are considered a good community fish when small, but that can change as they age. Adults are not as peaceful as the other gouramis and have been known to attack smaller fish. They can also get territorial as they mature and the males will squabble among themselves. The best tankmates are other fish that are of similar size and temperament. These fish can reach a length of up to 6 inches (15 cm), though most are a bit smaller than that in the aquarium. Juveniles can be kept in a 15 - 20 gallon aquarium but they will soon outgrow it. As adults at least a 35 gallon tank or larger will be needed. Because of their varying temperaments, the tank should be decorated in a way which allows both the dominant and quieter personality type fish to live happily. Densely planted areas will help create some hiding places and they will also appreciate the cover of floating plants for some shadowy areas. The Opaline Gourami is a captive bred color-morph of the Three Spot Gourami. Its history starts with an early variety known as the Cosby Gourami that was developed from the Blue Gourami by an american breeder named Cosby. Further developments of the Cosby Gourami became known as the Opaline Gourami or Marbled Gourami. The Opaline Gourami is now commercially bred in various color forms of its own. The Opaline Gourami is an elongated oval shaped fish and somewhat compressed laterally, with fins that are rounded and relatively large. It has long flowing ventral fins that are threadlike and extremely perceptive as they carry touch-sensitive cells. It also has a labyrinth organ, a respiratory organ which allows it to absorb atmospheric oxygen directly into its bloodstream. It can reach about 6 inches (15 cm) in length, but will generally be a bit smaller in the aquarium. They will be able to breed at about 3 inches (7.5 cm). They have an average lifespan of 4 to 6 years, but can live longer with good care. The body color is a pale bluish tone with a darker marble-like patterning that varies with each color form. There are usually dark blotches at the pectoral fins and at the base of the tail and white spots that extend on to the fins, giving them a very attractive pattern. Many different color variations have been developed from this fish as well. Size of fish - inches: 5.9 inches (15.01 cm) - Five inches (12.6 cm) is a good length for the Opaline Gourami to reach in the aquarium. They will breed at 3 inches (7.5 cm). The Opaline Gouramis are omnivorous, in the wild they feed on on crustaceans, insect larvae, and zooplankton. In the aquarium these fish will generally eat all kinds of live, fresh, and flake foods. To keep a good balance give them a quality flake or pellet food as the base to the diet. Supplementation should include white worms, blood worms, brine shrimp, or any other suitable substitute. Fresh vegetables can be offered as well, blanched lettuce being a good option for many aquarists. Generally feed once or twice a day. The Opaline Gourami will swim in all parts of the tank. When young they can easily housed in a 15 - 20 gallon aquarium, but adults will need at least 35 gallons or more. It is desirable to keep the tank in a room with a temperature as close as possible to the tank water to prevent damaging the labyrinth organ.The tank should have an efficient filtration system but should not to create too much of a current. This fish will be bothered by a strong current in the tank, especially if the tank is small. Air stones can help provide well oxygenated water. The Opaline Gourami is generally considered a good community fish when small, but they are not as peaceful as the other gouramis. They have been known to attack smaller fish. When they get older only keep them with fish their own size. Individuals will show varying degrees of aggression. Some will be very belligerent and will handle their tank mates quite roughly. Others will be peaceful to the point of shyness. The aquarist should be prepared to adapt their tank to suit all personality types. A mix of neutral personalities is an ideal goal for the range of tank mates. You should not include fish which will provoke this species into aggression as they are often passionate fighters. Fin nippers and gouramis should absolutely never be mixed. The trailing pelvic fins and generally slower movement of this gourami make it the perfect victim for nippers. The Opaline Gourami is also a skilled hunter and extremely small fish or fish fry rarely last long. Temperament: Peaceful - Although the fish is generally peaceful, very small tankmates may be bullied. Same species - conspecifics: Yes - Can be kept singly, in pairs, or groups. If kept in a group make sure there are plenty of hiding places to keep one or more of the individuals from being bullied. Males are territorial and will tussle amongst themselves, becoming very aggressive when breeding. The male Opaline Gourami has a longer and more pointed dorsal fin while the female's is shorter and rounded. Like most Labyrinth fish, the Opaline Gouramis are bubble nest builders. Breeding is fairly easy and providing a breeding tank that is to their liking is perhaps the biggest challenge. A pair will be most likely to spawn if there is a fair amount of plants, a good sized surface area, and the temperature is to their liking. Prior to spawning they should be well conditioned with small offerings of live and frozen foods several times a day. When well fed, females should begin filling out with eggs, appearing very plump. Opaline Gouramis are very hardy so disease is not usually a problem in a well maintained aquarium. Some diseases they are prone to are bacterial infections, constipation and Hole in the Head if good water quality, nutrition, and maintenance is not provided. With any additions to a tank such as new fish, plants, substrates, and decorations there is a risk of introducing disease. It's advisable to properly clean or quarantine anything that you want add to an established tank prior to introduction, so as not to upset the balance. The Opaline Gourami is readily available both in stores and online and is moderately priced. Hi there! I just want to ask about bubble nest. Because i always see bubbles sticking to the leaves of my artificial plant, but after sometime it disappears.. Do you think it is a bubble nest? Now i dont have a female gourami, only male. I just got a new tank, I have about 9 fish in a 10 gallon. One of my Opaline gouramis was always playing in the mirror so I got another. The first day they were chasing each other around a lot. (Not in a violent way) and I believe it's a male that I already had and I just got a female. Everything seemed fine until yesterday, I checked the tank and there was a chunk of tail (or the biggest fin in the back I don't know what it's called lol) of the female and now she stays in the cave. I have a lot and the male tries to hug her but she swims away and is almost never at the surface anymore. Will she heal and what do you think is the cause of this? Gouramis are territorial, so I think the male is letting the female know whose boss! Put some large rocks and plants in several different areas so the less aggressive fish have a place to hide. I have 4 gourami opaline and they all seem to get along fine. It's so cool though, because whenever I put my hand in to arrange something or check on the plants, they all come up to my hand and rub against it. I can get a few of them to eat flakes out of my hand now. ^,^ I love them! Part 2....after I read more on the fish I returned most back to the pet store. These are not schooling fish, they are more like betta and as they get larger (mine were all very young) they will fight each other. Best to only have one in a tank and even then he/she may bully other smaller fish. Some people say a male and two females is a good mix. The thing to remember is they may grow to be 4 inches. I have a male and two females. I am waiting to see what happens, but I am expecting some fighting, it's early days..